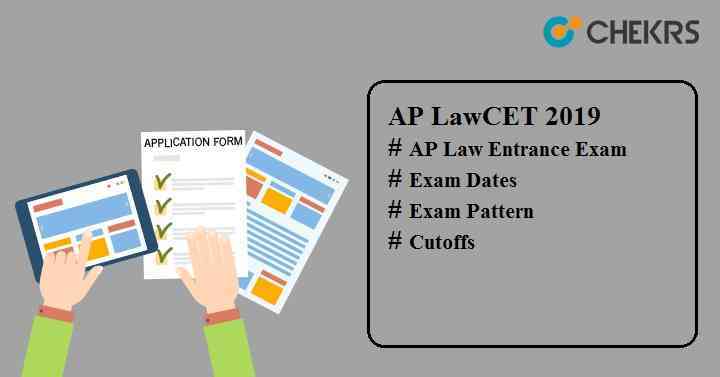 AP LAWCET 2019: Andhra Pradesh Law Common Entrance Test is a state-level law entrance exam conducted for the candidates seeking admission in 3 or 5 years BL/ LLB programmes. This exam is organized once a year by Sri Krishnadevaraya University, Anantapur on the behalf of APSCHE, Hyderabad. Latest Update: AP LAWCET 2019 and PGLCET Application Form is Available Online. Fill it before the last date. The university will release the notification of AP LAWCET Entrance Exam on its portal. All interested and eligible candidates can apply online via the AP LAWCET Application Form. To get admission in various government & private law colleges & institutions of Andhra Pradesh state, candidates will have to qualify the entrance test. Here we have mentioned the complete information about the Andhra Pradesh LAWCET. Candidates can check here the tentative exam dates of Andhra Pradesh LAWCET. Only eligible candidates can appear for this exam. So must ensure the AP LAWCET Admission Criteria before filling the online application form. Candidates should have Indian nationality. Aspirants must be a bonafide resident of AP state. Candidate’s age must be 30 years, if he/ she is applying for 3 years BL/LLB course. For 5 years BL/ LLB course, aspirant’s minimum age should be 20 years. Candidate should have completed his/ her graduation from any recognized university or institute with minimum 45% aggregate marks for 3 years BL/LLB programme. For 5 year BL/LLB course, at least 45% is required in class 12 or equivalent examination from any recognized board or Andhra Pradesh board. The university will release the notification of AP LAWCET Application Form through online mode on its official website. AP LAWCET Online Registration will starts from the month of March. See the following steps to apply online. Visit the University official website then follow the procedure as shown below. The syllabus will be set by the university exam head controller. To qualify the law admission test, students must prepare for the examination according to the AP LAWCET Exam Syllabus 2019. The exam syllabus for both courses will be different. For 5 years BL/ LLB courses, the question will be asked from intermediate level syllabus whereas for 3 years course, the syllabus will be of graduation level. Go through the entire syllabus so that you can gather study resources accordingly. Set time for each topic and follow the time. Make notes on important topics and revise that topic on regular intervals. Work on the weaker part or weak topics. Be Stress-free. Don’t think about the results. AP LAWCET Admit Card will be released in the month of April. All candidates who will submit the form on or before the last date, will be able to download the admit card and can appear in the examination. Candidates need to go to the official website of AP LAWCET 2019. Click on the option Download AP LAWCET Hall Ticket. Enter the qualifying examination hall ticket no, mobile no, date of birth and payment reference ID and then Click on “Download Hall Ticket” button. Take the print of it and bring it along during the examination. The university will release the AP LAWCET Answer Key for all the sets- A, B, C and D on its official site. Once after conducting the exam successfully, the answer key will be published within 2 or 3 days through online mode. Aspirants can also claim an objection on the wrong response through filling the objection form provided on the official portal. It will be filled and submitted in online mode only. After submitting the objection form, the university will publish the AP LAWCET Final Answer Key along with the results. The result will be announced online on its official portal by the university official authorities. All candidates who will appear in the examination can download AP LAWCET Score Card. Go through the steps below to download the result. Follow the given link ap.gov.in. Go to the View Results option. Enter the Registration no & LAWCET Hall ticket no and then click on “View Result”. The AP LAWCET Entrance Exam Result 2019 will be displayed on the screen. Candidates can download it and then take the print-out of it for further process. After the result declaration, the various participating colleges & institutions will issue separate cutoffs list for both 3 year and 5 year integrated law programmes. Candidates will have to score the cutoff marks i.e. minimum required marks to qualify the entrance test. On the basis of AP LAWCET Cutoff marks, a merit list will be prepared by the university official authorities and published on the university portal. Based on the AP LAWCET Merit List, candidates will get admission to the various law colleges & institutions for the academic session 2019-20. Applicants will be selected for the further process i.e. AP LAWCET Counselling on the basis of merit list. To be eligible to participate in the counselling round, candidates will have to qualify the entrance exam by obtaining the cutoffs mark. After the release of counselling date, students will have to report at the counselling venues decided by the university with the call letter issued on the official website of the university. Applicants will have to fill the choice form to get admission to colleges of their choice. On the basis of choice filled form, candidate’s performance in the examination and seats availability, candidates will get the seat. *Extension Possible, But not announced Yet! !